Jog Falls, created by the River Sharavati, is the highest waterfalls in India and is situated in the Shimoga district, of Karnataka. It is about 375 km from Bangalore and 30 km from Sagara and situated in a pristine and scenic location. Roads are in good condition at most of the places and the beauty is scenic throughout. As the river plunges 829 feet down, it separates into four distinct waterfalls popularly named Raja, Rocket, Rani and Roarer. During the monsoons, the falls are hidden behind a thin veil of mist, surrounded by lush green vegetation, giving the place a mystical atmosphere. steps into the valley. Believe me that am pretty hard. Once you get down into the valley, the view is superb panorama of mountains, sun and light blue sky. The falls then appear mightier and humungous. 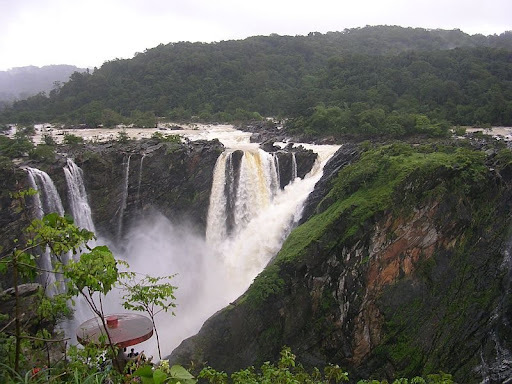 The majestic beauty of the Jog falls will mainly capture your attention here, but there are many other interesting tourist destinations around. You can visit Honnemaradu, a lake with an island, situated in the backwaters of River Sharavati which is a popular destination for water sports - kayaking, swimming and boating. Another place you will enjoy visiting is Tunga Anicut Dam, just 15 km from Shimoga, where you can enjoy boating and water sports in the surrounding lake. Between Jog falls and Shimoga, at Tavarekopoa is the popular Lion and Tiger Safari organized by the Forest Dept., where you can see wild animals up close. You don’t get a variety of food here; however you get a few South Indian delicacies. Small shops which abound the area serve Maggi and bread Omlette at reasonable prices. If you are making a road trip to Jog Falls, you should try to reach there with enough fuel to drive an extra 15kms as there is no petrol pump in the vicinity. To refuel your vehicle you’ll have to drive down 15kms towards Bangalore. Best season to visit Jog is monsoon.